Warning: Some people may find this post triggering. For help with self harm please refer to resources such as Headspace, Helpguide, Lifeline, or call your local crisis helpline. When I was 15 I was diagnosed with major depression, panic disorder and an eating disorder. Because I wasn’t confused enough, later on I was also diagnosed with obsessive compulsive disorder, generalised anxiety disorder, borderline personality disorder, and numerous other unpleasant sounding things ending in “disorder”. Basically, no one knew what was going on. It was a bit of a shithouse time really, culminating in a hospitalisation, threatened subsequent hospitalisations, and a fair amount of general chaos. Medication never worked because, obviously, I actually had Bipolar disorder, and prescribing anti-depressants without a mood stabiliser to someone with Bipolar disorder will usually just make things worse. But the doctors never picked up on that. So…one of my coping strategies was self harm. I remember the first time I hurt myself. I had just come home from lunch at a cafe. I was freaking out over what I had eaten – not because I was afraid of becoming fat, but because I thought the kitchen staff were trying to poison me (and despite telling the doctors this concern every single frigging week, the professionals never picked up on my psychosis either. Probably because middle class, skinny, teenage, perfectionistic, high achieving, introverted girls don’t have psychosis. They have Anorexia.) Anyway, I tried to make myself puke. That was a fail. So out of pure frustration I grabbed a pair of scissors and scratched myself. Immediately I felt relief. And about 10 seconds after that; shame. Harming myself was like a weird drug. I started doing it more and more. I became addicted to it. I am not going to go into morbid detail because I know how triggering this kind of stuff can be. But hurting myself felt like the one control I had in my life. It felt like I was externalising all the pain inside and making it visible. It was my punishment. It was my reward. It was my secret. This topic is not something I have ever really written about on here. To be honest with you, I don’t really like thinking about what I did to myself. But I think this is a topic worth discussing. There is so much controversy over self harm. And so much disrespect. Those who self harm are mocked, seen as attention seekers, and dismissed. I can’t speak for others, but I never self harmed for attention. Attention was the last thing I wanted, even going to the extent of self harming in places only I would see, or wearing long sleeved tops on even the hottest of days. I self harmed because I didn’t know what else to do. I self harmed because it was a release. I self harmed because I was unwell. 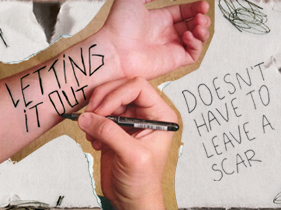 That’s another thing: there is a myth that self harming is a kind of suicide attempt. I didn’t want to kill myself. Well, I did, at times. But my self harm wasn’t a symptom of suicidality. My self harming behaviour was a tool, a destructive tool, that got me through some of the most difficult days of my life. For me, it wasn’t a step towards ending it all. Then one day I realised that I was running the risk of permanently scarring my body, in a way that would be eternally difficult to explain. I realised that I wanted to wear a bikini. That one day I would walk down the aisle and may want a sleeveless wedding dress. That I might have a kid who would ask what I did to myself. That it just wasn’t a healthy way of behaving. So I stopped. I say it like it was easy. It wasn’t. There was a long period after I self harmed regularly where it would be my “go-to” strategy if I was upset. It took a long time to change my behaviour. But I did it. And aside from the freak out I had in the locked ward last year, which I don’t tend to count as I was rampantly psychotic and actually set on killing myself as opposed to harming myself , I haven’t self harmed in years. Luckily I don’t have many noticeable scars. But the ones I do remind me every day on how far I have come, and the path I have walked. When I was a teenager I wrote a lot of poetry and songs. Today I came across this poem, and it stuck out to me. For me this explains perfectly the allure, horror and truth behind self harming. How I like it best. 12 because I don’t know how. So you won’t ask why. my cruel hands have wept. The other day we were driving back from my Immunology appointment at our local hospital , the same hospital where I was incarcerated for nine long weeks in The Dungeon. Anyway, we passed this little motel, the kind of establishment that is a mix between being super twee and super dodgy, and suddenly this chill spread through my body. I remembered the motel. But I couldn’t think of why. I started to rack my brain for information. I was sure I had never stayed there. I mean, why would I want to stay in a slightly dodgy motel situated on a major road, in a slightly dodgy area of town, in my own city? I didn’t know anyone who had stayed there. I couldn’t recall ever visiting it for whatever reason. Then suddenly I broke through the ECT induced memory loss and the reason hit me like a tonne of bricks. Of course. I thought. That was the place I chose to die. You see, when I was admitted to the Dungeon I was suicidal. These feelings got worse and worse as time progressed. None of my meds were being absorbed due to the pesky autoimmune disease. Things were going rapidly downhill. I heard voices which told me to kill myself. I began to see people who followed me around and continually tried to convince me that my loved ones would be better off without me. That I was a burden. That if I REALLY wanted to help people I should get rid of the problem. Me. Of course, when I expressed this to the medical staff they told me that the voices were wrong. But those voices…”The People” just used to ask me “Who ya gonna believe, Rachael? The doctor who has known you for five minutes? Or us, who have been with you for most of your life, know your intricacies and your family? We WANT to help you. Let us help you” These “people” were twisted but somehow they always made sense. And so they kind of grabbed hold of me. So I began to make a plan. I managed to hack into the hospital university’s wi-fi through my own university. I searched the net and chose a place, this particular motel, to die. I decided how to do it. I had cash, a credit card, and a bus card. I was a voluntary patient on an open ward. I knew I could walk out at any moment and just never return. Somehow, and I don’t recall how, around this time the doctors twigged that I was losing grip. I was placed on one-to-one supervision, and much to my frustration at the time, my plan was foiled. Thank god. I find it very awkward to write about this. I feel an intense shame that I even THOUGHT about killing myself – much less making an elaborate plan. I feel like someone reading this is going to shout out “See! Unfit mother! Disgrace to society!” This is such a difficult topic to talk about. Suicide is such a stigmatised issue. I mean, God, it’s a HORRIBLE issue. There’s no doubt about it. But it’s real. And it should be talked about. But we don’t like to talk about it, because those who kill themselves, or try to kill themselves are selfish. They are weak willed. People who attempt suicide are looking for attention. They are all sorts of negative things that definitely do not encourage those struggling with suicidality to seek help. Let me just make something clear. 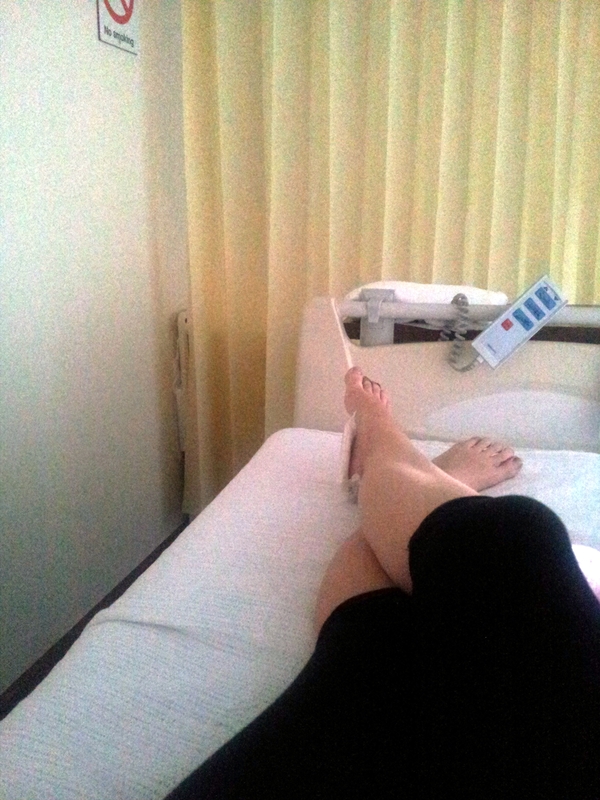 When I was meticulously plotting my own death in hospital I was not looking for attention. Quite frankly, that was the last thing I wanted. Also logic doesn’t come into it when you are suicidal. Although it is true that “suicide is a permanent solution to a temporary problem”, in the depths of despair you don’t think that way. All of your thoughts become warped. I truly believed it was my best option, and would be kindest to those I loved. Obviously, I was also, and this is really important, very very sick. People who are well generally do not want to kill themselves. There is this thing called human survival instinct. Against the odds, humans want to survive. That’s why people fight and fight through terrible adversity and illness. We WANT to live. People who decide that the best option for them is suicide are generally very unwell and urgently need help. I truly believe that if the issue wasn’t so stigmatised, people may feel more able to ask for help when they need it, and perhaps unnecessary deaths could be prevented. Yeah that made me feel great. This type of experience, which is unfortunately, so very common for people with suicidal thoughts, just encourages stigma, and perpetuates the cycle. Different doctor, different place, but I was still scared of talking about how I felt. I was really lucky though. I got the help I needed. I had a hospital keep me safe. Many other people aren’t this lucky. There are so many deaths out there that could be prevented. But still, despite my feelings on stigma, I feel the shame. This is not something I will ever discuss, even with those closest to me. It feels like a dirty aspect of my life that I wish I could change, and this post feels like a confession. I hope that one day I will be able to accept myself, and my experiences. I hope that I will learn to stop the self stigma. I hope that one day society will be able to talk about the issue that is killing so many people. I just couldn’t stop moving. I tossed, I turned, I paced, I jittered. I got up in the night to pace. I wrung my hands and jogged my legs and drove everyone around me up the wall. “Stop! Tell me what’s bothering you.” Hubster would say. “I don’t know!” I would reply. “Stop! Take some deep breaths and try to keep still” My doctor would say. “I can’t!” I would say, before pacing around the room again. It had begun about a week before I was admitted to hospital, and it was unlike anything I had ever experienced before. In my experience, depression is accompanied by lethargy. A complete inertia and apathy towards life itself. You don’t want to *do* anything when you are depressed. Merely getting up in the morning is a mammoth task. But this wasn’t like that. I was acutely depressed. Suicidal. Hopeless. Yet, for the life of me, and despite the plethora of psychoactive medications I was offered, I just couldn’t stop moving. 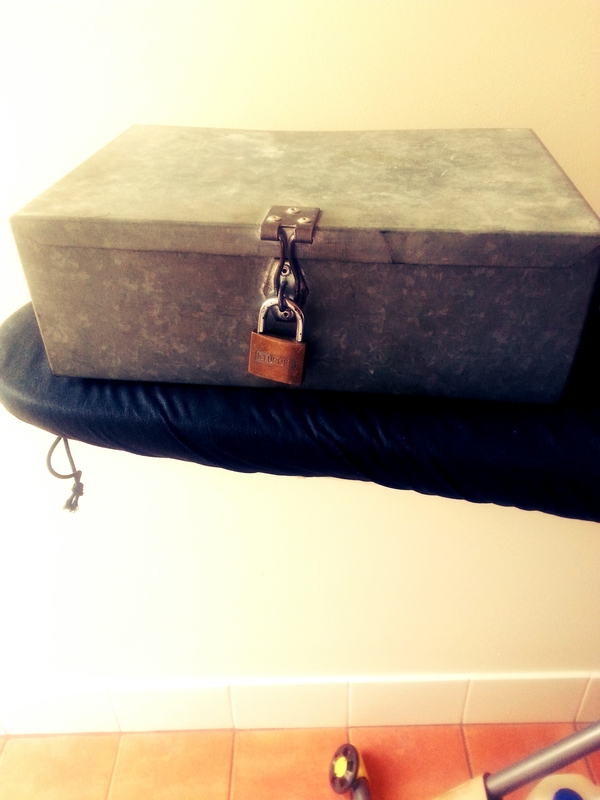 I was moved to the most secure room on the ward. The bathroom door had a peep hole. This disturbed me. Though looking back the peep hole should have been the least of my concerns. Under ‘special’ supervision a nurse was required to be present every time I used the bathroom anyway. Although I was admitted to hospital as a voluntary patient, I was informed in no uncertain terms that if I were to attempt to leave the premises I would be sectioned under the Mental Health Act. One morning I woke up to find three nurses conducting what appeared to be a sweep of my room. “We’re just giving your room a bit of a clean” they told me. “Umm, okay then” I said. I didn’t really think much about it until I had my shower and wanted to dry my hair. My hairdryer was gone, and when I questioned the nurse about it she told me it was for my own protection. On closer inspection I noticed that all my power cords were missing as well as my shaver, scissors and nail clippers (ok fair enough), dressing gown cord (lethal weapon there…) and my shoes (seriously?!). Hubster later told me that women’s bra’s are often removed in institutions. How he knows this I’m not entirely sure. Thankfully my underwear was left safely in my drawer. Small mercies! Although I understood that the hospital was taking my safety into their own hands, I wasn’t entirely sure why. I mean, I knew I was suicidal. I knew I was severely depressed. But most of the other women in the ward were depressed. Yet they didn’t need a special room, or 24 hour supervision. They were allowed to go for walks alone, and wear dressing gowns with a cord. On a few occasions I felt angry about this perceived inequality, sometimes I felt upset. But mostly I was so depressed that I just didn’t care. I didn’t care that my rights, dignity and privacy had been taken from me. It just gave me one less thing to think about. All of this happened well over a month before the manic episode that confirmed my diagnosis of bipolar disorder. But at this point in time the doctors were already suspicious that I had bipolar. You see, somewhere in between mania and depression there is a strange phenomenon clinically termed a ‘mixed state’. You have symptoms of depression and of mania at the same time. The agitation of mania without the euphoria. The chronic low mood of depression without the apathy. A mixed state is one of the most dangerous psychological states to be in, and many suicides associated with bipolar disorder occur during a mixed state. Somewhat ironically, the lethargy that accompanies depression acts as a kind of safety net. A depressed individual may simply not have the energy to execute a suicide attempt. During a mixed state individuals are seriously depressed, but fuelled with energy – a deadly combination. What I know now is that I was experiencing a mixed state, and this went on for many painful weeks. No amount of anti-psychotic or anti-anxiety medication dampened my agitation. No amount of anti-depressants lessened my depression. I barely slept, despite the copious sleeping pills I was offered. My son was almost exclusively cared for by the nurses and my husband. To this day I have very few memories of this point in time and rely on my doctor’s and husbands recollections of how I was. A mixed state is such an appropriate term. Because I really was mixed up, and I really was in a state. I was experiencing symptoms of depression, mania and psychosis all at the same time. I couldn’t explain my past and I couldn’t think about the future. I wanted to live, but I wanted to die. I wasn’t sane but I wasn’t crazy. While I was in hospital I marvelled at my baby boy’s development. I watched him pull himself along on the floor, start to crawl, and finally pull himself up to stand. And as is the way of things, the mixed state passed, and transformed into something else completely. I was taken off ‘special’ supervision and onto 15 minute checks, and then half hour checks, then hourly. Soon I even got to go for walks, and was moved to a different room (without a peephole!). Then finally, like my son, and with the encouragement of Hubster and the medical staff, I reached up and stood on my own two feet.